The Ibanez PC12MH Acoustic guitar is quite a popular guitar, especially among beginners and it earned its spot on our best acoustic guitars under $200 roundup. 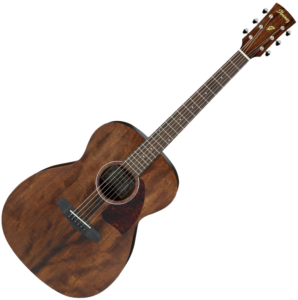 This guitar seem to be geared towards entry-level guitar players who want a reliable and decent guitar at an affordable price. However, one of the weaknesses of this guitar is that the bass (although still present) isn’t comparable to a guitar with a bigger body. 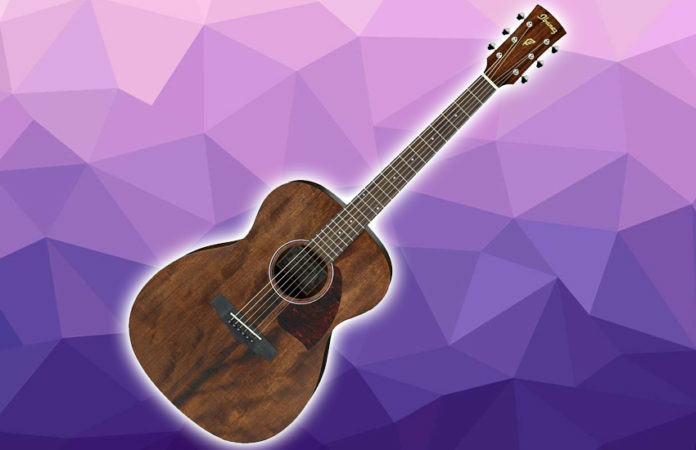 This guitar may appear flimsy at first glance because the soundboard and wood is quite thin, but this is what allows it to have a quality higher end. The guitar is covered in beautiful mahogany in the front and back with the fretboard and bridge made of rosewood allowing you to feel the wood grain as you brush the guitar with your fingers. It also has open geared vintage style machine heads which gives it a classy look. There is no binding on this guitar and the only inlays are the fret dots and the rosette around the sound hole. The nut and bridge are both made of a hard plastic but doesn’t impact the sound quality of the guitar. However, although there’s no creaking or difficulty getting strings up to tune, be careful as some guitar players have reported the strings going flat quite often. The guitar usually arrives in perfect shape and is well packaged to prevent any harm to its components. However, the guitar may not come out perfectly. We believe that this is a great guitar for students who are thinking about learning the guitar for everyday practice. If you take care of this guitar, it will be able to last you for quite a while (8 years and onward). But if you are constantly taking it out on the road and using it, it will have a shorter lifespan. At its price, we’d say that this is one of the best entry-level guitars that you could go for before spending a lot on a hobby you might not pursue. However, for more experienced guitar players, you may want to consider spending more to get a higher quality guitar.